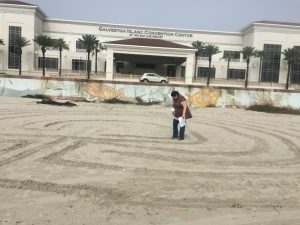 Meg Scott-Johnson and Glynden Bode offered a workshop at APCE 2019 Annual Event on creating your own labyrinths. 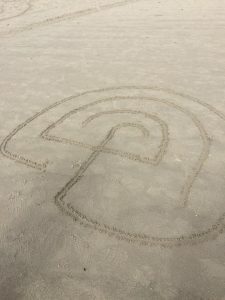 Participants first practiced drawing three-circuit and seven-circuit designs, then walked across the street to the beach where they created these labyrinths in the sand. Those who created them walked their labyrinths. The group returned to workshop space and discussed possibilities for creating labyrinths when they returned home. It was variety of the spaces available (rooms of various sizes, parking lot, grassy areas, etc.) and the materials available (tape, pine needles/cones, stones, cans of food, etc.) were many. Thus, one does not need to have a big budget in order to offer a labyrinth experience. The labyrinth is a wonderful spiritual tool for use with all ages—children, youth, adults, and older adults. And yes, these different age groups can share the labyrinth space with each other, inviting them all to view the prayer experience through a variety of lenses. These prayer experiences can be stand-alone or part of a larger event, such as a retreat, a day of prayer, a liturgical season, All Saints Day observance, confirmation, or Holy Week. 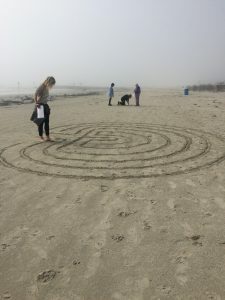 The labyrinth can contribute to one’s sense of God’s nearness and presence, of being connected to all of God’s creation, of inner peace, of being loved, clarity and discernment, as well as community and interconnectedness. Every walk is different, and a good way to enter into the time is by offering it to God and letting go of one’s own agenda. Walking a Sacred Path, Rediscovering the Labyrinth as a Spiritual Practice by Lauren Artress. Exploring the Labyrinth: A Guide for Healing and Spiritual Growth by Melissa Gayle West. Labyrinths from the Outside In: Walking to Spiritual Insight by Donna Schaper and Carole Ann Camp. The Sacred Path Companion: A Guide to Walking the Labyrinth to Heal and Transform by Lauren Artress. Labyrinths, Ancient Paths of Wisdom and Peace by Virginia Westbury. The more than 250 photographs of labyrinths around the world in this book includes ancient use and currents uses of labyrinths. Praying the Labyrinth: A Journal for Spiritual Exploration by Jill Kimberly Hartwell Geoffrion and Lauren Artress. 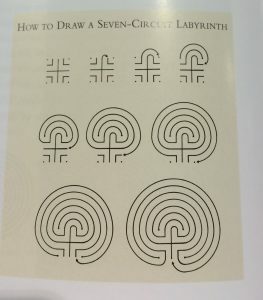 A nice little book with ideas on how to use the labyrinth. Meg Scott-Johnson is a Veriditas-trained labyrinth facilitator, a trained spiritual director, a member of St. Philip Presbyterian Church in Houston, and serves on the Presbyterian Disaster Assistance National Response Team. She lives in Kerrville, Texas. 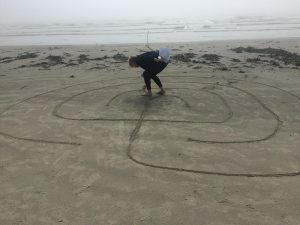 Glynden Bode is a United Methodist minister and trained spiritual director, whose ministry includes taking a canvas labyrinth to a variety of venues and helping to train people to become spiritual directors. She lives in Houston, Texas. Simplest one I did was in a sanctuary with aisles down the walls and a center aisle. We walked back and forth thru the pews on one side down to the communion table for meditation then back and forth out the pews on the other side.